Tech giants are generally slow when it comes to making their products accessible to the differently abled. But lately, some of them have been working on innovative projects that will accommodate more users. One of the most interesting of these comes from Chinese tech conglomerate Alibaba, which introduced a smart display technology to help the visually impaired with shopping and payments on their phones. 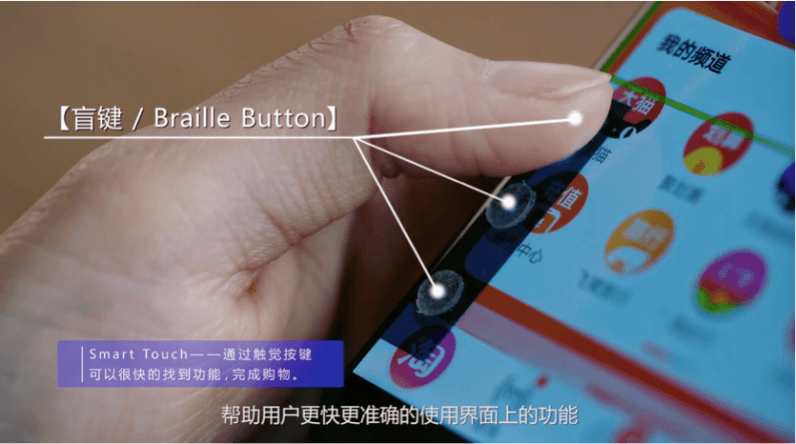 As per a TechCrunch report, Alibaba’s R&D wing, Damo Academy, collaborated with China’s Tsinghua University to develop a cheap silicone sheet with sensory buttons that go on top of a smartphone display. The sheet – which costs just 3.6 cents to produce – has three small buttons on each side; you can press them to perform actions like ‘Confirm’ or ‘Go back’ while using supported apps. Currently, the smart film works with special versions of Alibaba’s e-commerce app Taobao and Alipay, its mobile payment service. The buttons on the film have different functions in each app. Right now, The research team is testing and refining the product with volunteers. It is also working on making the technology device-agnostic. The film will launch officially early next year. Alibaba doesn’t intend to make money by selling its smart film; instead, the company will distribute it for free via its brick-and-mortar outlets. Many tech companies are taking up projects to help the visually impaired take advantage of smart devices to improve their lives. Google’s Lookout app helps people ‘see’ things around them using their phones; Mircosoft has an app called Soundscape that assists people in getting around a city through audio cues. More ideas like this, please.